Download Other JioApps: MyJio App Download, jioTV & Jio4GVoice APK Download. 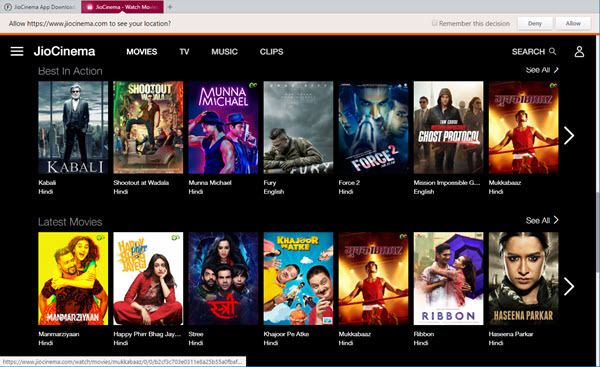 You download other free Movie Apps like Hotstar App, Sony Liv App also. Here are some of the questions asked by our readers. Is JioCinemas free to use? Yes, It is free to all Jio Network Customers. Other mobile network users cant use it, but you can use your friend’s id. Your Jio ID is your Jio mobile number. You can link your Email Address to your Jio Phone number and use it as your Jio ID. Can we watch Jio cinema on the laptop? Yes, you can use it on your Laptops or Desktops. All you have to do is Visit Jiocinema.com. How to Watch JioCinemas on Desktop or PC? Visit Jiocinema.com in your Browser. You can see different options in the top navigation menu. Click on the Human icon on the top right corner of your screen. Then you will get Jiocinema login page. Here, you can use MyJio App details to log in and get free access to movies. There are thousands of Hindia and Telugu movies are available to watch without paying a single Paisa. What’s new in JioCinema Movies TV Music Apk? More new languages have been added. Jiocinema App allows you to watch live cricket also. Many people think that it is only for Cinemas, Tv serials, and video songs but one can watch more than 100+ Live TV Channels on JioTV App. JioCinema Android and iPhone apps are a great way to pass our time when we are bored, and especially when we are going on vacation in trains or flights. The great thing about this is, Reliance owns it. We all know how big a company is Reliance. So, I think they will add thousands and thousands of new, old and all sorts of movies in the coming days. Jio Network is rapidly growing India. It is recently crossed Airtel, Vodafone and other networks regarding monthly bandwidth used by customers.